In the first quarter of 2019, two new Australian Federal Government-funded projects related to the restoration of endangered species—Building Resilient Agricultural Systems on Kangaroo Island (KI) and Safe Haven for Threatened Species (Phase 2 of the KI Feral Cat Eradication Program)—will launch. These projects bring the total restorative investment from the Australian Government’s Regional Land Partnerships (part of the National Landcare Program) and KI’s Natural Resources Management (NRM) Board to over $7 million. Brown bandicoot. Photo via NRKI. “This will be facilitated by the construction of a cat-proof fence across the narrow isthmus of the island, isolating from the rest of KI. The eradication of feral cats from the peninsula should also see many knock-on benefits for the agricultural sector, stopping the main means of spread for livestock diseases sarcocystis and toxoplasmosis that cause substantial economic cost,” he added. The Building Resilient Agricultural Systems on Kangaroo Island project is also a four-year project that will build on the previous sustainable production program, with a key focus on restoring soil health. The project will demonstrate innovative grazing and cropping systems following regenerative agriculture principles, incorporating Natural Sequence Farming and integrated pest management under KI conditions. It will also showcase new tools and technologies to improve soil health, water infiltration and plant nutrient availability to build the resilience of KI farming systems. Following an extensive testing period in non-toxic mode, the Felixer™ Grooming Traps, which are designed to specifically identify and target cats, are set to begin trials in toxic mode from February 2019. The Kangaroo Island Feral Cat Eradication Program aims to eradicate feral cats from KI by 2030, to make it one of the world’s largest feral cat-free inhabited islands, further galvanising the Island’s reputation of being a safe haven for native Australian wildlife. “This trial adds valuable information to the lessons learned from our successful eradication of feral goats and feral deer that was achieved with the cooperation of the public and with a good track record for safety. We cannot succeed in this eradication program without the same level of support from the community,” he added. 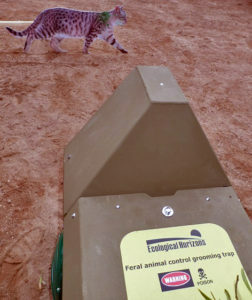 The Felixer™ Grooming Traps, which have been used extensively in northern South Australia and the Northern Territory, work by identifying cats from their size, shape and gait as they cross in front of the machines. When the traps identify a cat, the machine administers a single dose of a toxic gel to the animal’s coat, which is ingested when the cat grooms itself. NRKI Feral Cat Team Leader Venetia Bolwell says the grooming traps proved highly successful in identifying the target species when trialled without poison. “When the traps activate, they photograph what has passed in front of them. By analysing these photos together with records of whether animals were identified as targets or non-targets, we have established that the traps are effective in identifying the target species,” Ms Bolwell said. Warning signs will be placed around the trial sites to advise people to keep their dogs restrained and away from the area, as is done in other parts of Australia. The feral cat eradication project, a joint initiative of Natural Resources Kangaroo Island (DEW and the KI NRM Board) and Kangaroo Island Council in collaboration with the Department of Primary Industries and Regions South Australia (PIRSA) and partnered with the Invasive Animal Cooperative Research Centre and Ecological Horizons, is funded by the Australian Government with in-kind support from DEW. Building resilient agricultural systems on Kangaroo Island. KI Natural Resources Management Board presiding member Richard Trethewey said this additional funding was great news for the Island and was testament to the hard work of board staff, and their dedication to the Island and its community. “Following on from the two earlier announcements, this additional funding now brings the total amount to be invested in KI by the Australian Government’s Regional Land Partnerships to $7,107,963,” Mr. Trethewey said. “The standard of the proposals submitted to the Australian Government by the board and its staff was highly praised and I think this is reflected by the substantial funds being awarded to KI. 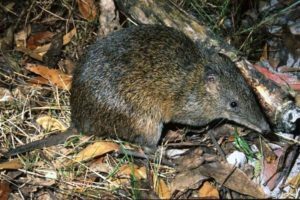 The Safe Haven for Threatened Species Project will be delivered over four years and will build on the work already undertaken by the Feral Cat Eradication Program,” he continued. 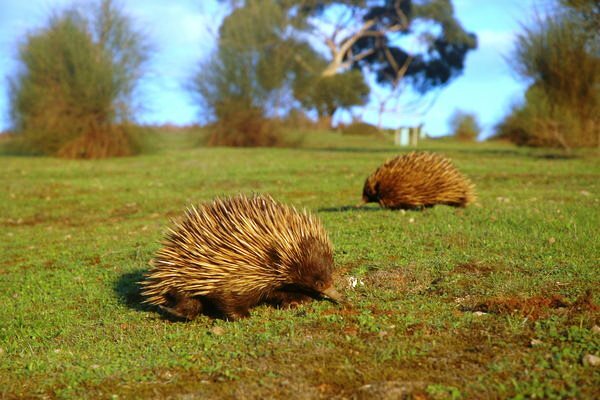 Featured photo of the endangered Kangaroo Island echidna via NRKI / C. Wilson. Learn more about the Building Resilient Agricultural Systems on Kangaroo Island project. Learn more about the Safe Haven for Threatened Species Project.